Man, college was a long time ago … 25 years. 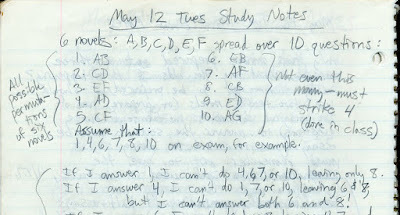 But I still remember it so well, especially the really hard parts, like final exams. I used to do these mammoth study sessions in the school library, which was always packed during dead week. Fittingly, I’m putting together this blog post in a public library, which is also hopping. I wrote the following poem during a study break. It wasn’t much of a break because a) I couldn’t leave the library for fear of losing my seat, and b) the poem itself required mental effort. But writing it did treat my brain to a little novelty. Maybe yours, too! What’s on the test I think I know. Though I began ten hours ago. A nervous bundle, wracked with fear. Of doubts about the test I’ll take. I doubt there’s an English major in history who wouldn’t immediately recognize my poem as a take-off on Robert Frost’s “Stopping by Woods on a Snowy Evening.” I really don’t know what inspired me to suddenly stop studying and do this quasi-tribute. Interestingly, as I look now on the history of Frost’s poem I see that his effort and mine were somewhat similar. I’d been working all day and into the night preparing for my final exams in English and, during a break, suddenly had a poem idea pop into my head. So it was with Frost, who was working all night on a long poem and, taking a break to watch the sun rise, suddenly got the idea for “Stopping by Woods.” He wrote the new poem “about the snowy evening and the little horse as if I’d had a hallucination,” in “just a few minutes without strain.” I wouldn’t say there was anything hallucinatory about my poem, though after 15 hours straight of studying that’s not so far off. And I wrote my poem very quickly too, and if there was any strain it at all it came from replicating Frost’s cool rhyme scheme (more on this later). My professors tended to give us pretty good clues into the kinds of things that would be on the final exam, but not enough to give me a lot of confidence. We read a ton of books for each class—at least half a dozen—and it was a good idea to read book each more than once. The second time through, a million things would become clearer because less of my brain would be taken up trying to keep characters straight, order events in the right sequence, and figure out what the hell was going on in. But there just wasn’t time to read everything twice, so I had to try to guess what books mattered the most to the prof and would end up on the exam. I don’t think this “ten hours” figure is accurate. If you look at the first picture in this post, you can see an arrow with “15 hrs” indicated. (I often tracked how long I spent studying, though I really can’t say why. Probably just out of habit, like my cycling training diary.) Maybe the 15 hours included some studying I did at home. Or maybe I didn’t feel like reworking this line of the poem to accommodate a two-syllable word (i.e., “fifteen”). This phrase, “slouch and frown,” is really pretty weak. The slouch is okay but I should have focused on how tight my neck was, how hunched my back, and how tense my entire body was. That would have led in to the next line much more nicely. I liked this phrase “nervous bundle” right away, as it conveys the idea of being “bundle of nerves” and also the idea of my spine and how all the nerves join in this big bundle or something, and how aware you get of all that when you’re so tired and stressed out that even your spine starts complaining (see previous comment). 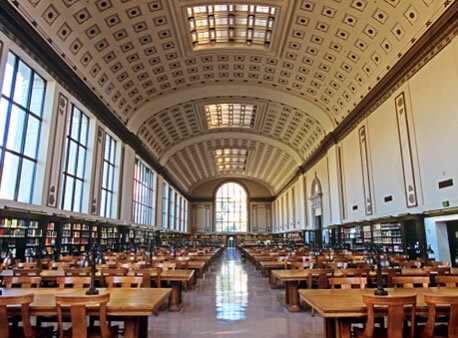 Frankly, that gorgeous room, with its thick oak desks and high ceiling, inspired me to study longer and harder, and the relatively small number of students it accommodated had a calming effect. 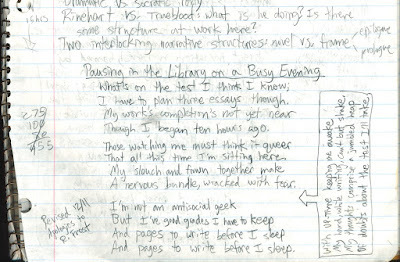 It was definitely in Doe that I wrote this poem—I can remember it vividly, even down to exactly where I was sitting. I’m not sure how I managed to score a seat in Doe during Dead Week. I wish I could blow this place up. This is sheer misery. All these fervent, steaming, stressed-out people, their legs popping up and down like a jackhammer, the wads of gum stuck to this study box now bubbling and dribbling down towards the desk (which is swimming in a flood of grease from pimply foreheads and chins). Somebody has thrown a textbook into a 2nd-floor toilet, where it disrupted a long-abandoned, un-flushed load—turning it to cocoa. This I see in a gruesome flashback, instigated by my still unrelieved bowel. UPTime was, and is, a big horse-pill containing caffeine, gingko biloba, ginseng, cayenne pepper, Spirulina Blue Green Algae, Echinacea, and other stuff. Whether or not UPTime worked better than NoDoz, it had the advantage of being free, for me. UPTime sponsored the UCSB cycling team with loads of free product, and even after I transferred to UC Berkeley I still had a bunch left. Plus, I worked at a bike shop and I got the manufacturer to send us a whole bunch of free product samples, which carried me through all the way to graduation. If anything, UPTime worked too well: I could stay awake for ages and ages but wasn’t exactly comfortable. Speaking of the rhyme scheme, Frost created something pretty clever there. At first blush it’s not so special: the first two lines rhyme, the third doesn’t, and then the fourth line rhymes again (i.e., with the first two). So the rhyme scheme is AABA. So what? Well, check out the fifth line (i.e., the first line of the second stanza). It rhymes with the third line (of the first stanza), which previously hadn’t rhymed with anything. This convention holds for most of the poem, so the first three stanzas go AABA BBCB CCDC. Perhaps because Frost didn’t’ want to leave any line unrhymed, he didn’t follow the convention for the last stanza (i.e., didn’t do DDED) but rather had every line in the final stanza rhyme: DDDD. So it’s a 16-line poem with only 4 different line endings. Cool, huh? I’m tempted to pat myself on the back for appreciating this nifty rhyme scheme even without having Frost’s poem in front of me when I wrote my poem. (This was before the Internet, after all). But since I mimicked not only Frost’s convention but the actual rhymes (that is, I did AABA BBCB CCDC DDDD as opposed to EEFE FFGF GGHG IIII), it’s possible I wasn’t actually aware of what I was doing. It’s easy to see why a high school student would be obsessed with getting good grades: after all, as explained here, the conventional wisdom is that if you don’t get perfect grades, you’ll never get into a good college, and you’ll never get a good job or a good spouse and you’ll live in miserable, lonely poverty your whole life. But why would a college kid, already enrolled in the school he wanted, be wracked with fear about maintaining good grades?